This patient was quite physically active however had difficulty toning areas such as her stomach. This is the patient post Hi Definition Liposuction. Note the athletic curvature to her stomach and the reduction in circumference. This has emphasised her female athletic appearance. Here at Dr Lanzers your aftercare is extremely important to us so that we can ensure your healing is going well and that we answer any of your questions. We understand the importance of caring for our patients not only during their time here in the clinic, but once they go home and recover. We like to see our patients the following day and this appointment is used to remove dressings, ensure the procedure site looks as expected and to see how you have recovered from your general or local anaesthetic. We then like to see our patients one week later and often this appointment is used to remove sutures and check bruising and swelling. Two weeks post procedure is a good time to start to see more of your shape once the initial bruising and swelling is going down. Dr Lanzer will also see you one month and three months post procedure. If at any stage between these dates you have questions or concerns, we encourage our patients to contact us straight away. Dr Lanzer carries a pager 24 hours a day, 7 days a week. We prefer to see our patients in person but understand that this cannot always happen, so we have email and sms options for sending through photos and messages. Dr Lanzer understands that providing the best aftercare service possible is essential to patient recovery and eliminates many of the possible complications associated with surgery. All of our interstate patients are added to a specific aftercare list so that they can be contacted by our nurses on a regular basis. We can provide you with a copy of your before photos and are also able to match these up against your after photos so that you can see the improvement. Dr Lanzer is always interested to follow your progress and ensure your satisfaction with the procedure and care received. Even though the patient in the above case study was physically active and on her target weight, she experienced problems shedding excess fat deposits. In some cases, patients can have trouble losing fat despite living a healthy lifestyle, since some areas with fat deposits can be quite persistent. Since this patient was already living a healthy lifestyle, and only had a small amount of fat to lose, she was a good candidate for liposuction. Even though liposuction removes persistent fats from the body, liposuction should not be considered as a weight loss treatment. The procedure will remove persistent fats from the body, but the patient must maintain an active lifestyle with a healthy diet to keep on benefiting from the procedure. If a healthy lifestyle is not maintained after the procedure, persistent fats can return in other locations on the body. Therefore, good candidates for liposuction are usually patients who already live a healthy lifestyle, have a good exercise routine, and are around their target weight. 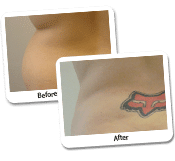 In short, liposuction is used to reshape the body of a patient, not to reduce their overall weight. If you believe you might be a good candidate for this procedure, please contact the Dr Lanzer Clinic for a consultation with Dr Lanzer.